After five months of planning, Paula Cubero was about to marry her fiance, Enrique Catter. The church was rented, the band was hired, and the caterer was booked. In less than a week, Enrique and his family -- along with hundreds of guests -- were going to land in her home town of Guadalajara, Mexico, and the wedding of her dreams was going to commence. "I had fireworks scheduled," Paula remembers. "His family was from Peru, and I planned so many surprises to show them Mexican culture." In May 2009, the swine flu hit Mexico, and the country closed its borders. In the process, it also locked Enrique and his family outside the country, leaving Paula without a groom. "I was devastated," she remembers. "I had to tell everyone we were canceling, and had to try to get our money back." While some of the vendors were helpful, others were not. The band kept the money, as did the church, and others fought her tooth and claw to hold onto the deposits she had paid. All told, Paula estimates that the cancellation cost her and Enrique about $20,000 -- basically, their entire life savings. "When this happened, we didn't even want to think about planning another wedding," she recalls. To add insult to injury, a health crisis a year later left the pair $40,000 in debt. "We realized that we were never going to be able to save again for a wedding." Paula's experience was extreme, but hardly unusual. Last year, for example, thousands of weddings were canceled when Hurricane Irene swept up the East Coast. A year earlier, the eruption of the Eyjafjallajökull volcano in Iceland disrupted air service -- and wedding plans -- across Europe. 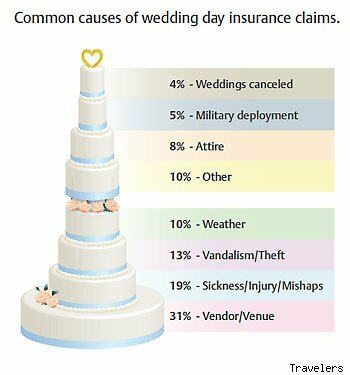 And weather is hardly the only threat couples face on their way to the altar: Illness, a military deployment, vendor bankruptcies and a host of other problems can derail a wedding. The costs can be brutal. In 2011, the average American wedding cost $26,501. 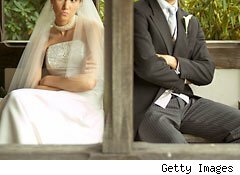 For a young couple that has scrimped and saved for their big day, an unforeseen cancellation can quickly wreck their plans and wipe out their finances. With this kind of money on the line, it's hardly surprising that a growing number of companies are offering wedding insurance. Travelers, America's largest insurance company by market value, launched its program on Valentine's Day 2007, and it quickly grew in popularity. "We cover the unexpected," notes Chantal Cyr, Travelers' vice president for personal insurance. "A wedding costs as much as a new car. You'd never buy a new car without insuring it, so why would you pay for a wedding without insuring your investment?" As anybody who has ever planned a wedding can attest, there are dozens of things that can go wrong. While it's hard to anticipate every possible problem, Cyr argues that her company's insurance program comes close. "We are selling absolute peace of mind," she claims, pointing out that Travelers' wedding insurance policy covers rehearsal dinners, damages to wedding dresses, the theft of wedding presents, and even problems with wedding photos: "If your photographer goes out of business or doesn't deliver your wedding pictures, we will pay to have your wedding party reassembled and the photos reshot." Of course, while wedding insurance has been a major benefit for couples, it has also proved a major boon to the insurance industry. Libby Bierman, an analyst at Sageworks, a financial information company, noted that, while insurance agents and brokers posted gains in 2011, their growth has lagged behind that of most private companies: "Managers or business owners in this industry may be looking to diversify the services they offer as one way to increase revenues in 2012." In this regard, wedding insurance could be a good bet for Travelers -- and its competitors. Cyr declined to comment on the growth of Travelers' wedding insurance program, but noted that it has branched out: "We now offer special event insurance to cover Bar Mitzvahs, Bat Mitzvahs, birthdays, anniversaries, and a variety of other occasions." For the Catters, everything worked out: The year after Paula's health crisis, they won a free wedding in the "Wings of Love" contest sponsored by the Empire State Building and Colin Cowie Weddings. Surrounded by friends and family, they were married at the Empire State Building on Valentine's Day 2012. Today, the pair live in Greenwich, Conn., and are expecting their first child. But while luck brought a happy ending to the Catters, most wedding disasters don't end quite so well. On the bright side, with wedding insurance, couples can have a second shot at their special day.